ÆTHELWOLD (Æthelwold), St. Æthelwold was a great reformer and restorer of English monastic life following its destruction during the Danish invasions. St. Æthelwold received monastic tonsure from, and was later ordained to the priesthood by, St. Dunstan (19th May) at Glastonbury. St. Æthelwold served briefly as Abbot of Glastonbury, before moving to Abington to serve as its Abbot. In 963, having been appointed by King St. Edgar the Peaceful (8th July), St. Æthelwold was consecrated Bishop of Winchester, and, together with SS. Dunstan (19th May) and Oswald (28th February) led the monastic revival of the era. Along with other achievements in the service of this cause, he restored the monasteries at Newminster, Milton Abbas, Chertsey, Peterborough, Thorney, and Ely to monastic life after their occupation by married clergy. For his tireless work, St. Æthelwold came to be known as ‘The Father of Monks’. The Winchester School of Illumination flourished under St. Æthelwold (the most important surviving manuscript of the school, The Benedictional of Saint Æthelwold , currently housed at the British Library, was commissioned by him), as did developments in music and liturgy. The Regularis Concordia was at least partly, if not mainly, his work, and St. Æthelwold is most likely the author of an account of the monastic revival of his time, ‘King Edgar’s Establishment of the Monasteries’ . St. Æthelwold also translated the ‘Rule of St. Benedict’ into English. His precision and clarity in this translation was a factor in establishing the Winchester dialect as the standard literary language in the late Old English period. St. Æthelwold reposed 984, and was succeeded by St. Elphage the Martyr (19th April), the future martyred Archbishop of Canterbury. entreat Him to have pity on us all. ALMEDHA (ELED, ELEVETHA), St. Almedha was a daughter or granddaughter of the great King St. Brychan of Brycheiniog (6th April). According to tradition she was martyred by heathens near Brecon, Powys, Wales at some point during the sixth century. ARCADIUS, twenty-second Bishop of Bourges; he was a participant in the Council of Orleans (538). St. Arcadius reposed circa 549, his relics are enshrined at the church of St. Ursin in La Chapelle-Saint-Ursin, France. BONUS, FAUSTUS, MAURUS, and COMPANIONS, St. Bonus was a priest who was martyred along with Faustus, Maurus, and nine others at Rome under the Emperor Valerian circa 257. Their martyrdom is mentioned in the Acts of Pope St. Stephen. EXUPERIUS (SOUPIRE, SPIRE), according to tradition St. Exuperius founded and served as the first Bishop of Bayeux during the first century However, later research by the Bollandists as well as others found little basis for this legend and place his episcopate in the fourth century During the Viking invasions, his relics were translated from Bayeux to Corbeil near Paris, where the Cathédrale Saint-Spire de Corbeil is dedicated to him. As a result, St. Exuperius is sometimes incorrectly identified as having been Bishop of Corbeil. 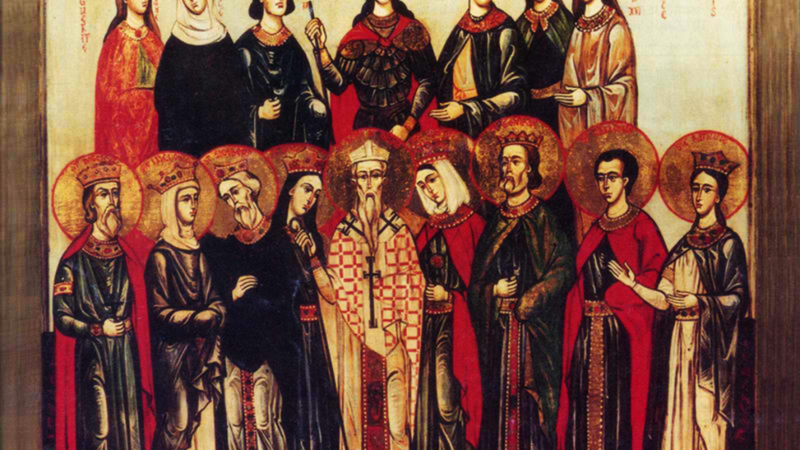 FAITH, HOPE, and CHARITY there are many traditions which have evolved regarding the lives and martyrdom of these saints, who have always been in greatly venerated throughout the Christian world, both East and West. All that can be stated with certainty is Faith, Hope, and Charity the three daughters of St. Sophia (30th September), named for the three Christian virtues, were martyred in Rome under Hadrian, circa 137, at the ages of twelve, ten, and nine years respectively. FRIARD and SECUNDEL, hermits on an island near Nantes, who reposed circa 577. JONATUS, a disciple of St. Amandus (6th February), St. Jonatus served as Abbot of both Marchiennes and Elnone Abbeys on the Scarpe River near the French – Belgian border. He reposed circa 690. JUSTIN, a child from Auxerre, who, whilst travelling with his father from Paris to Amiens, was martyred about 20 kilometres (12 miles) north of Paris. KENNETH (KINED), (Sixth Century), St. Kenneth is believed to have been a hermit in the Gower Peninsula, who later went to Brittany. It has been suggested that he was the son of St. Gildas the Wise (29th January), and had been married and fathered a son before entering Llanilltud Fawr and receiving monastic tonsure from St. Illtyd (6th November). While these legends are most likely unfounded, his name on Liturgical calendars and place-name evidence provide historical support for the probability that founded the church of Llangennith on the Gower Peninsula. St. Kenneth later travelled to Brittany, where he is greatly venerated in the area around Languidic. St. Kevin also had a chapel at Ploumelin. In the 1880s, an incised stone monument with images apparently illustrating the St. Kevin legend was discovered during renovation work at St. Mungo’s Church, Dearham, Cumbria. It is displayed there as ‘the Kenneth Stone’, though the Saint’s connection with Cumbria is still unexplained. LEUS (LEO), (Fourth Century), a priest, or possibly a bishop, in Ferrara in Emilia-Romagna, Italy. The relics of St. Leus were venerated in Vicenza, in the Veneto region of north-eastern Italy. MARY the CONSOLER, (Eighth Century), the sister of St. Anno of Verona (13th May). There are no details of her life extant, however, it is likely she participated in the translation of the relics of SS. Firmus and Rusticus (9th August). NEMESIUS, (Date Uncertain), there is no reliable information about this saint who is venerated near Lisieux in Normandy. PEREGRINUS, an Irish pilgrim who settled as a hermit near Modena in Italy after a pilgrimage to the Holy Land. St. Peregrinus reposed 643. RIOCH, a nephew of St. Patrick (17th March), St. Rioch was one of the reputed fifteen sons of St. Patrick’s sister St. Darerca (22nd March), ten of whom went on to serve the Church as Bishops. St. Rioch was Abbot-Bishop of Inishbofin, Co. Galway in Ireland, and reposed circa 480. SEVERUS (SÉVÈRE), a nobleman who served as vicar of a rural parish in Bigorre in the south of France. St. Gregory of Tours (17th November) praised him for his charity. Following his repose, circa 500, the relics of St. Severus were translated to the church of Rustan, which soon changed its name, and became a place of pilgrimage. The village of St. Sever de Rustan in Bigorre in south-west France commemorates his name. VERUS, the ninth Bishop of Vienne, and participant in the Council of Arles (314). St. Verus reposed circa 314.